After spending several years as the lead vocalist and rhythm guitarist for the mid-’70s hard rock band Montrose, Sammy Hagar began a solo career that produced several hits and made him an album rock favorite. Hagar became a true star once he joined Van Halen in 1985, but he was a popular hard rocker ever since his first album with Montrose. After giving up a boxing career, Hagar began singing in the late ’60s, performing with various California bands including Skinny, the Fabulous Catillas, Justice Brothers, and Dust Cloud. During this time, he built up a solid reputation in the California hard rock scene. Former Edgar Winter guitarist Ronnie Montrose asked Hagar to join his band, Montrose, in 1973. Hagar recorded two albums with Montrose before going solo in 1976, taking the group’s bassist, Bill Church. Montrose‘s drummer Denny Carmassi later joined Hagar’s band, along with keyboardist Geoff Workman. Hagar’s self-titled “red album” was his first chart entry; it eventually went gold. In 1979, he created a new supporting band featuring Workman, Church, guitarist Gary Pihl, and drummer Chuck Ruff. This lineup played on Hagar’s most popular solo album, 1981′s platinum Standing Hampton, plus 1982′s gold Three Lock Box with only one member missing — drummer Ruff was replaced by David Lauser. After Three Lock Box and its number 13 hit single “Your Love Is Driving Me Crazy,” Hagar played several shows with guitarist Neal Schon, bassist Kenny Aaronson, and drummer Mike Shrieve; the group recorded a live album under the name Hagar Schon Arronson Shrieve (HSAS), as well as a studio version of Procol Harum’s “A Whiter Shade of Pale.” His 1984 album VOA contained the hit single “I Can’t Drive 55,” which peaked at number 26. In 1985, Hagar replaced David Lee Roth in Van Halen; his first album with the group was 1986′s 5150. 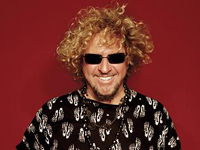 Hagar released his last solo album in 1987; the record was coined I Never Said Goodbye in an MTV contest. Hagar stayed with Van Halen through the remainder of the ’80s and half of the ’90s. During that time, the band had four other multi-platinum albums — OU812 (1988), For Unlawful Carnal Knowledge (1991), Live: Right Here, Right Now (1993), Balance (1995) — before tensions began to surface between Hagar and the rest of the band.